The most stable biomechanical fixation for talar neck fractures is two parallel screws placed in an antegrade fashion from the posterolateral talar body into the anteromedial talar head, crossing the talar neck fracture. 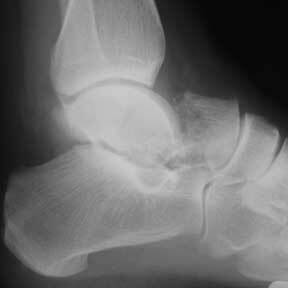 Histologically, this area of the talus has the most dense bone, allowing for improved screw purchase. (Swanson TV, ICL 39;1990:147). Dorsomedial surface is often comminuted. Plantar and lateral surfaces are best used to judge reduction. Consider medial malleolar osteotomy to improve medial exposure. 6 Weeks: Evaluate for Hawkins Sign (subcondral lucency in the dome of the talus indicated revascularization). 62% anatomic reduction, 19% nearly anatomic reduction, 19% poor reduction. Overall union rate = 88%. 100% posttraumatic arthritis of the subtalar joint. 50% osteonecrosis overall. 86% osteonecrosis for open fractures. (Lindvall E, JBJS 2004;86A:2229). Mean Ankle Society Ankle-Hindfoot Score = 71 +/- 19 out of 100 points (higher score better). Secondary reconstructive surgery = 24 +/- 5% at 1 year and 48 +/- 10% at 10 years postinjury (Sanders DW, JOT 2004;19:265).